You may determine already from the downsized resolution that the model is rendered with a "dreamy glow" and the background has a nice and creamy out-of-focus blur (you can see higher resolutions when you click on the image). The lens produces some geometric distortion and vignettes already quite strong on mFT sensors. 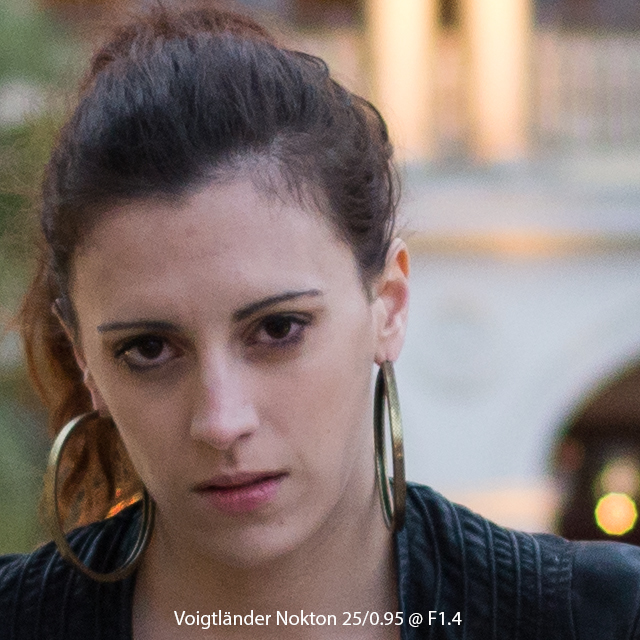 These characteristics are propably the reason why some people tend to say this lens produces a very cinematic look. In this example the model is rendered very sharp but I still miss some "pop" as the out-of-focus portions of the background attract too much attention with swirly patterns. Vignetting and distortion are quite obvious but a bit less compared to the Angenieux. Compared to the previous examples you will recoginze a significant increase in overall image quality. The model is rendered with adequate sharpness, the background blur looks smooth enough and there is only a little vignetting and distortion. The model is rendered already very sharp with more "pop" at open aperture whereas the out-of-focus portions of the background are rendered significantly smoother and creamier than with the other lenses already at this downsized resolution. Vignetting and distortion are almost invisible which lets me speculate that the usable image circle might be significantly larger than what a FourThirds sized sensor requires. Now let us take a closer look to the "bokeh" - the way how the lenses render the out-of-focus areas in the background and the shape of the circles of confusion (CoC) that punctual highlights produce out there. 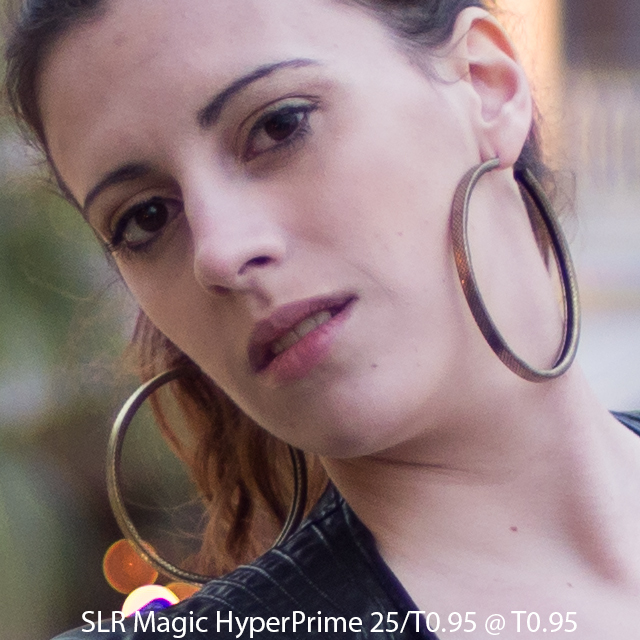 As aroused already in suspicion from the overall views: The SLR Magic HyperPrime renders the out-of-focus background to the smoothest degree and produces very neutral circles of confusion - simply close to perfection. The Voigtlander Nokton tends to be a bit more nervous in the out of focus areas and depending on the distance from the center, the circles of confusion get more and more deformed but all in all it produces still a fairly nice bokeh. 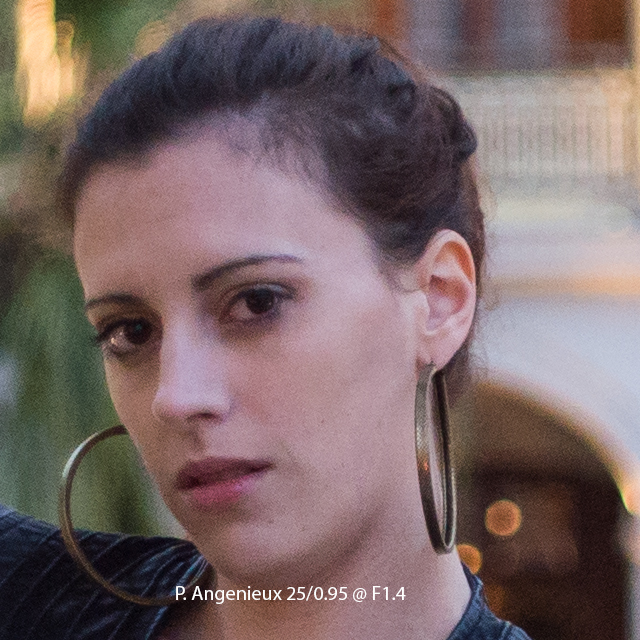 The bokeh of the Angenieux is quite nice as well and of course has a very unique character. 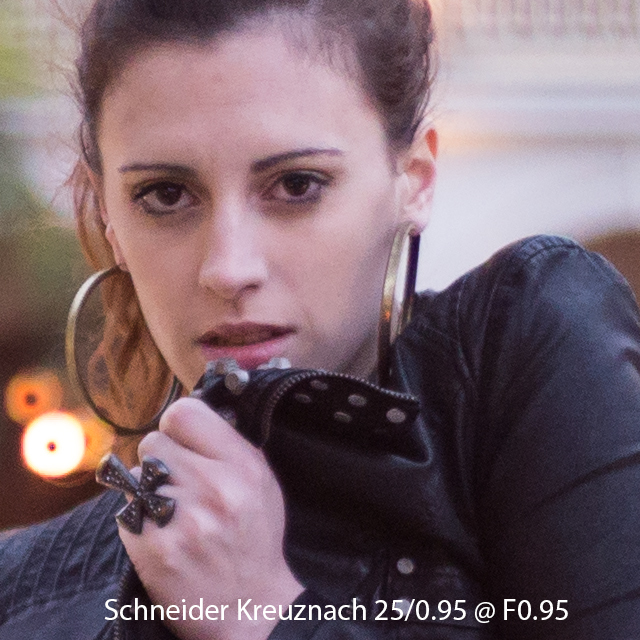 For my taste the Schneider-Kreuznach fails regarding bokeh quality. It is very swirly and the circles of confusion are something that does not remind me on circles anymore - but be aware: the shots were taken with the version with integrated spotfilter. 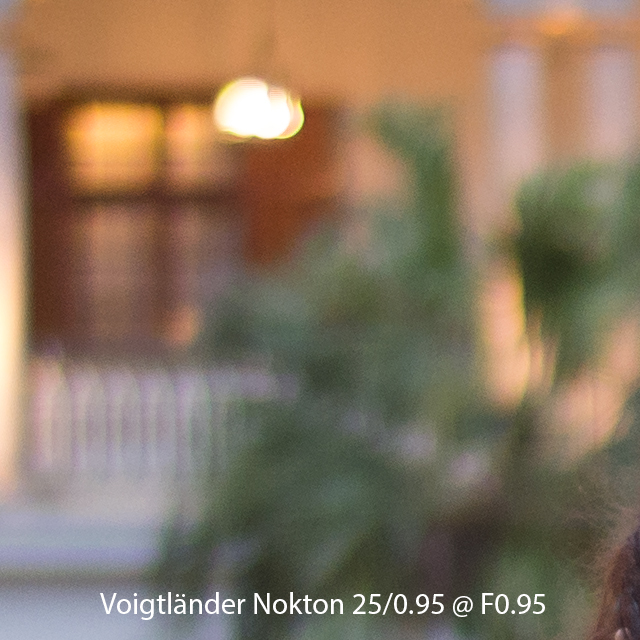 Bokeh of the version without spot filter looks a bit different. 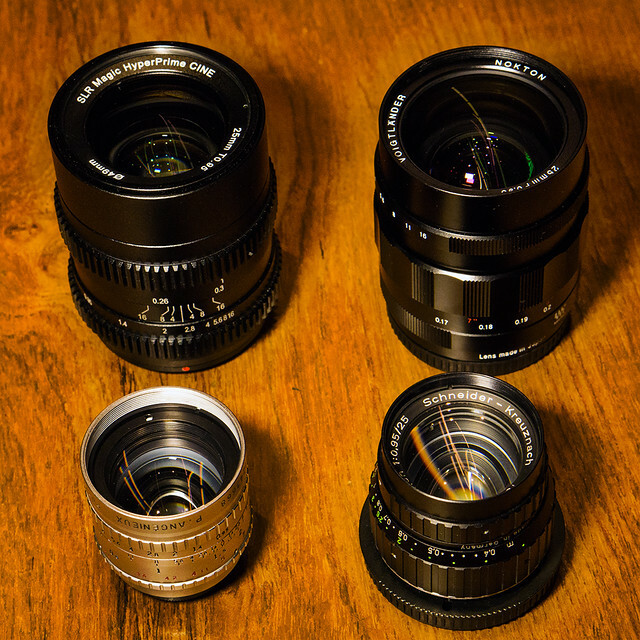 From these samples the Voigtlander Nokton and the SLR Magic HyperPrime CINE are able to deliver good sharpness already at open aperture with a slight advantage to the HyperPrime that also shows the most neutral circles of confusion here. 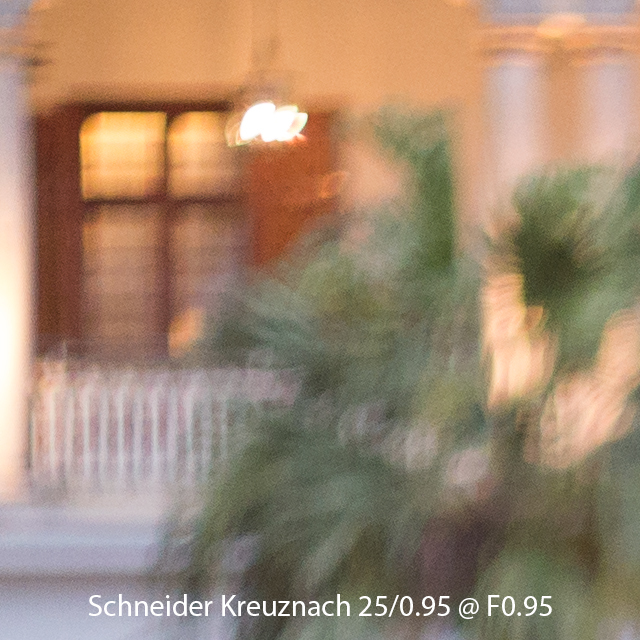 The Schneider-Kreuznach is extremely sharp already at F0.95 but with another deduction for the dark spots in the circles of confusion ("donuts") caused by the built-in ND spotfilter. Again let me remind you that shots taken with a version without spotfilter will look different regarding this aspect. The Angenieux is significantly softer, it needs to be stopped down to F2.0 in order to get comparable sharpness in the focused area. The model was standing about 3m away from the camera and as I mentioned already earlier, she slightly changed her position during the shots, so focus is not exaclty consistent throughout all shots. 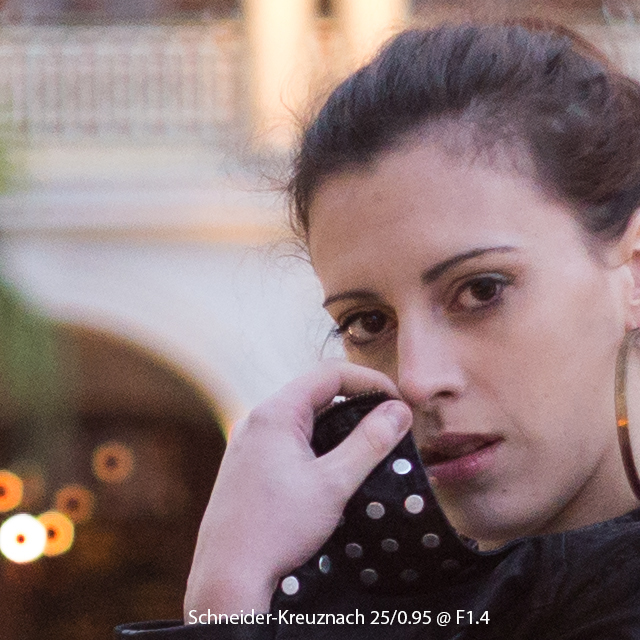 Nevertheless the impact on the out-of-focus rendering can be almost ignored. The circles of confusion in the center of the image have about the same size (e.g. 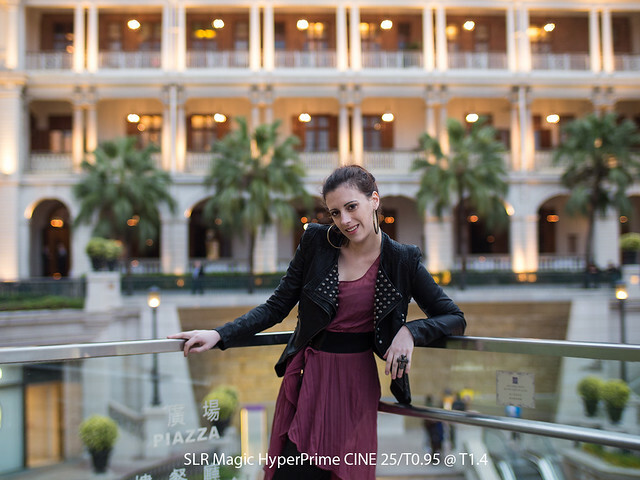 about 60 pixel for the HyperPrime CINE and about 59 pixel for the Nokton). 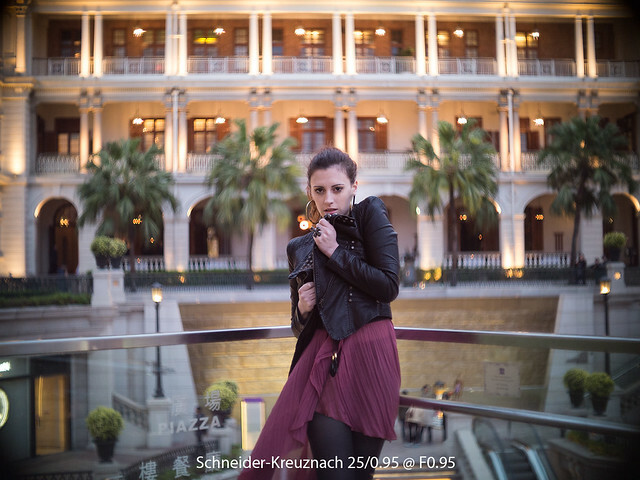 You may be interested as well in a short comparison when the lenses are stopped down to F1.4 / T1.4. Notably that stopped down, the aperture blades of the SLR Magic HyperPrime CINE still keep a round shape - and so the circles of confusion whereas you can count already the number of aperture blades of the other lenses. Sharpness becomes comparable to all but the P.Angenieux (which is getting closer regarding sharpness to the others as far as these light conditions and already high ISO settings allow to compare) and the bokeh of the Schneider-Kreuznach is getting less swirly when stopped down. 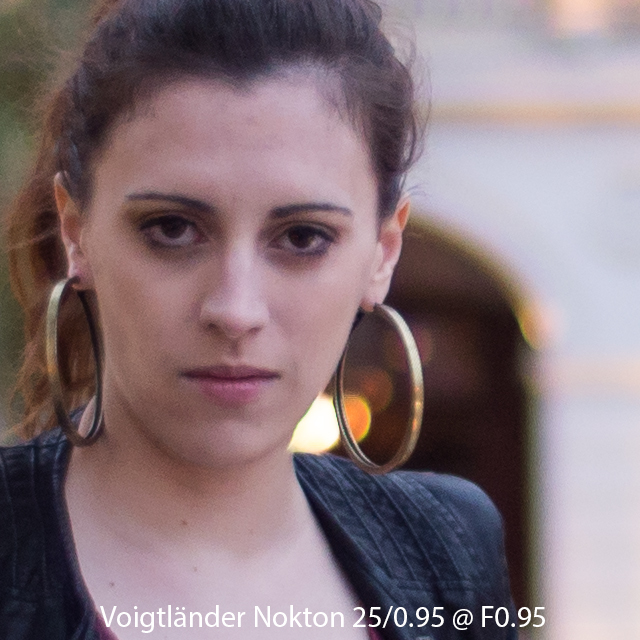 Already in 2010 the Voigtlander Nokton 25/0.95 demonstrated, which advantage in image quality can be gained for mFT sensor cameras with a modern and more complex lens design implemented with high quality glass and coatings but at the price of less compactness. 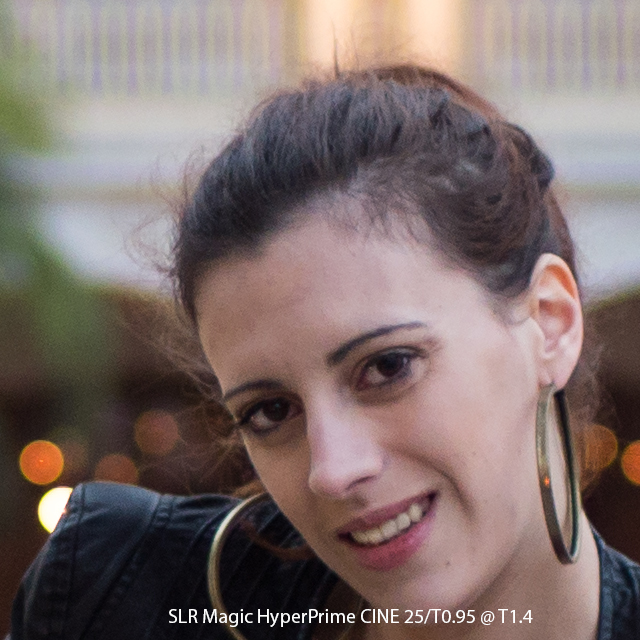 The SLR HyperPrime CINE 25mm T0.95 at about the same size and weight shows imposingly that sharpness as well as bokeh quality at F0.95 (in fact the HyperPrime CINE provides an aperture of about F0.9 in order to allow a transmission of T0.95) could be even more optimized at a very attractive price. If you prefer extreme center sharpness (for the price of a swirly bokeh with dark spots in the circles of confusion) from the Schneider-Kreuznach or a very characterful cinematic look with stronger vignetting at maximum compactness from the P.Angenieux, the two classic designs may still be an interesting alternative. Andrew Chan from SLR Magic explained to me that the lens used in this comparison still was a pre production assembly (step 2). The final production version has been fine tuned for even more sharpness by reducing purple fringing / chromatic abberation to a lower degree. 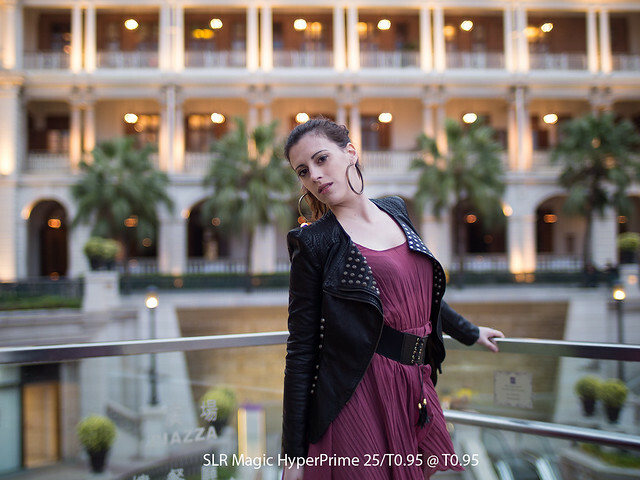 HyperPrime lenses can be ordered at http://www.slrmagic.com/products.php. 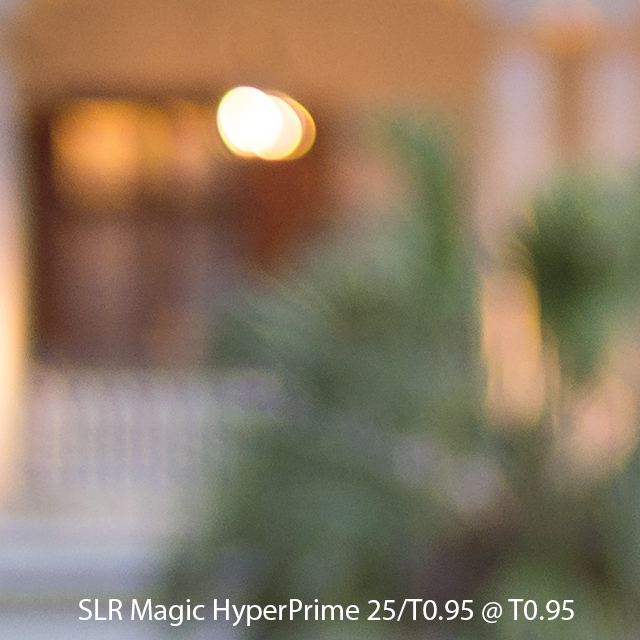 If you do not find the lens you are interested in, simply contact support (at) slrmagic.com by e-mail.